So. South America. We're here. Have been for a while. But I want to begin this story at the beginning. 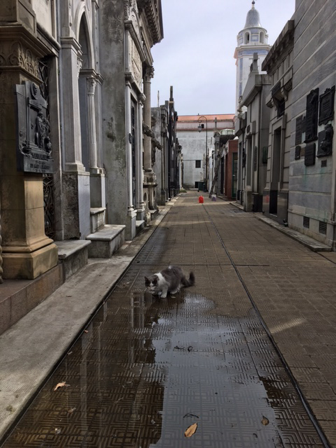 I told Hubby this afternoon that I was going to sub-title this post : "The Urban Sophisticates Do Buenos Aires." Sadly, he was trying to settle down for a nap and falling out of bed laughing was not conducive to his rest. Urban we are not. Not really, not deep down. And sophisticates we definitely ain't. Ha. So being in South America is pretty big for us. We've travelled a lot, but this feels completely different. Seriously different, and seriously cool. 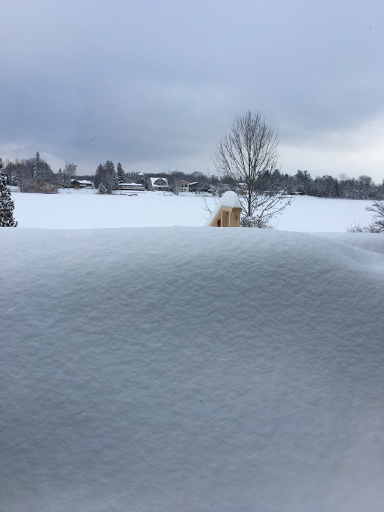 This is what we left behind in Ottawa not long ago. A recent snowfall that we were relieved did not happen on our "getaway day" as Hubby always calls our departure day. This time of year in Canada, snow can derail even the best laid plans. That's our deck below. Snowed under, you might say. This is what we piled into the neighbour's car for the trip to the airport. 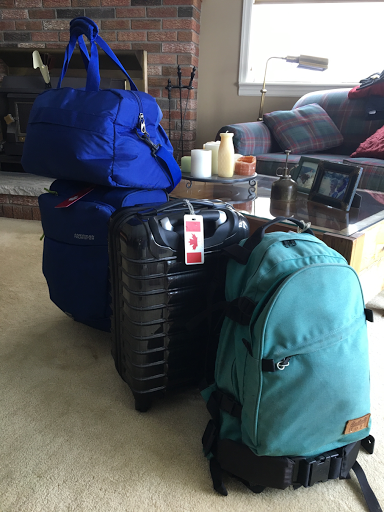 One small spinner bag each, my weekender tote bag, and Hubby's backpack. Not much for six weeks, and three climates. But we had planned carefully, and hopefully it would suffice. In fact, after over a week on the road, I'm beginning to think that I could have pared it down even further. We were 28 hours in transit between Ottawa and our hotel in Buenos Aires. We had a 5 hour lay-over in Toronto, and a two hour stop the next morning in Santiago where we had to leave the plane and do the whole security thing all over again. Standing in a long line of sleepy, jet-lagged, confused, hot, and cranky travellers. Then after the last leg of the journey, another hour in the customs line in Buenos Aires, and a two hour drive into the city through sluggish traffic...meant that our 3:30 arrival was now looking like 7 pm. Thank goodness the desk staff at our hotel was friendly and cheerful, suggesting we try the casual restaurant on the corner for dinner before we staggered back to our room and fell into bed. 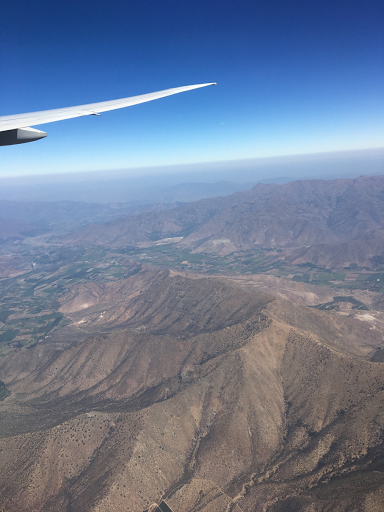 The shot below was taken as we flew into Santiago. The Andes, I presume. 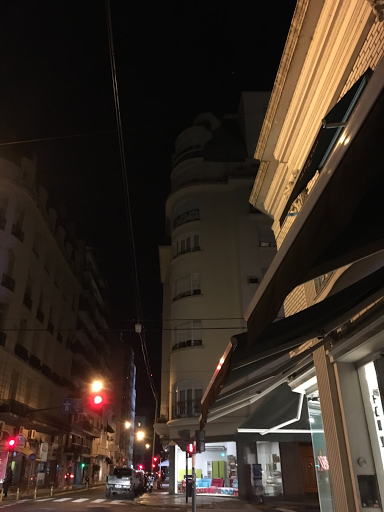 Buenos Aires was everything we thought it would be, and nothing like we had imagined. If that makes any sense. Beautiful and majestic with wonderful buildings reminiscent of Paris. Much of the architecture of 19th century Buenos Aires was built in the French style since, as we were told, France was much admired here for its style and beauty. I regret not doing more reading on Argentine history and architecture. But research for travel can get pretty confusing sometimes as you struggle to make sense of a place you've never seen. 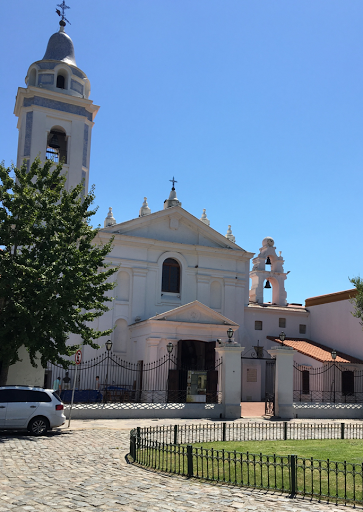 This is the church of "Our Lady of the Pilar" in Plaza Intendente Alvear, near the famous Recoleta Cemetary. It's beautiful against the blue sky, isn't it? 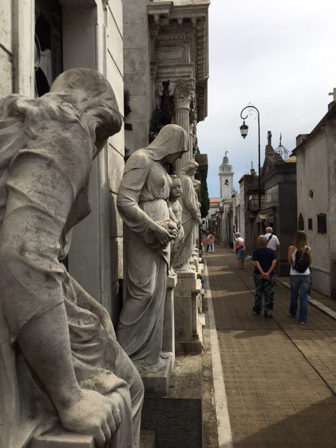 We strolled through the famous Ricoleta Cemetary on our first day. 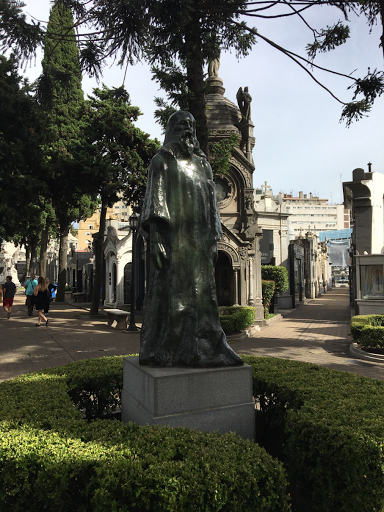 The eternal resting place of the great and good, and the rich and not so good of Buenos Aires for generations. An amazing kind of city of the dead. It certainly is stunning. Overwhelming. And not a little eerie. 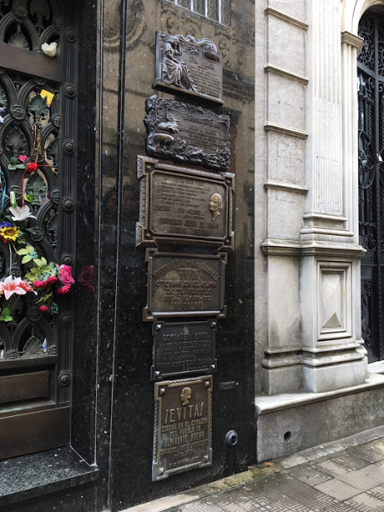 Like everyone else we wanted to see the grave of Eva Peron. She's buried with her parents and sister in the Duarte family tomb. Our guide on the second day of our visit told us the stories of the numerous times over the years that Evita's body has been "kidnapped" for political reasons. I had to get a shot of this kitty. Not all the residents of Ricoleta Cemetery are dead, apparently. We took a bus tour one day. It helped us to get our bearings and showed us parts of the city we could walk back to later on our own. 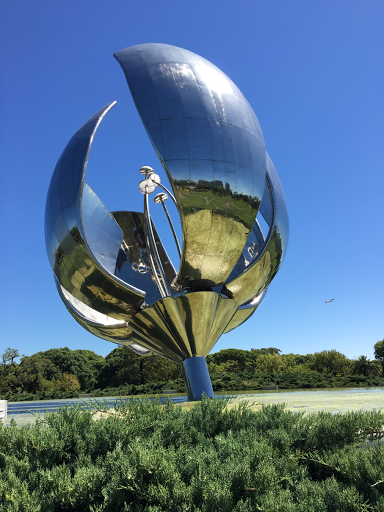 This is the Floralis Generica sculpture in the Plaza Nasciones Unidas. Cool, eh? The aluminum and steel petals open in the morning and close at night. 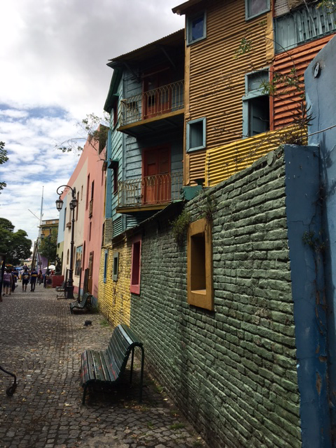 Buenos Aires is full of colour, and vibrant street life, and art. 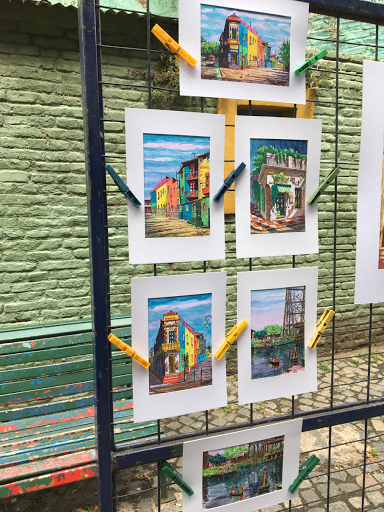 Like these murals on the buildings in the neighbourhood of la Boca. 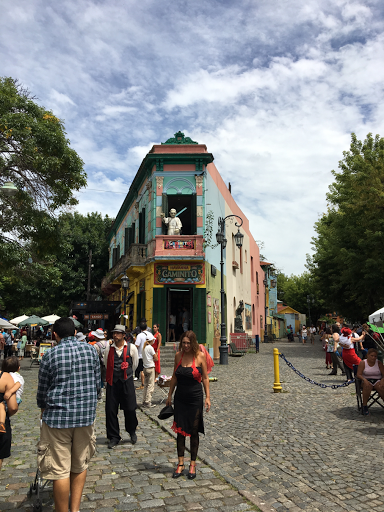 And of course there was colour everywhere we looked in the famous "Caminita" street in La Boca. Not to mention tango dancers vying for our attention. And even a statue of the pope on the balcony of this building. The Caminita is home to many artists. I'd have loved to bring home one of these brightly coloured paintings. But I settled for a photo. With all the whimsy and colour it's easy to forget that this is still a very poor area of the city. Despite her big smile and practised banter, the tango dancer's velvet dress was a bit tatty, and her shoes well worn. And just down the street, well, life looks quite different. 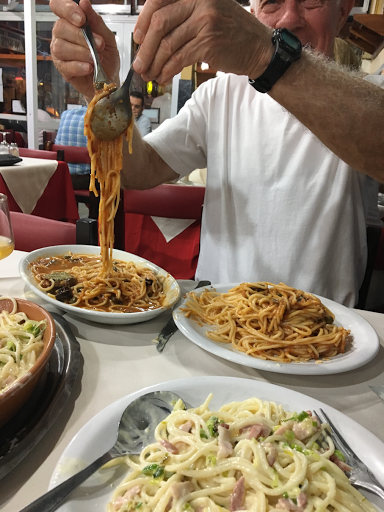 What we loved best about Buenos Aires was exploring our own neighbourhood of Retiro on foot, and the adventure that was dinner each night. Alejandro, the lovely concierge at our hotel, sussed us pretty quickly. When we asked for restaurant recommendations he sent us to unpretentious, local, neighbourhood places. 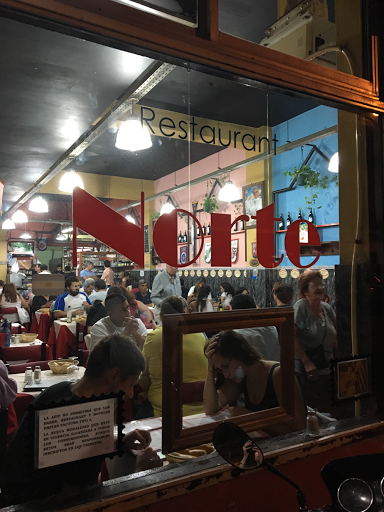 Like El Norte. Where we had huge portions of pasta, good wine, and lots of chuckles with the waiter who spoke no English, and kept forgetting our water. The third time I asked he slapped his forehead and laughed. We forgave him, though, since his attention was much distracted by the adorable antics of the young grandson of his friends who were sitting across from us. In fact it looked as if almost everyone else in the place knew each other, and all the staff... given the shouted greetings, the kisses, and the table hopping. On Sunday we strolled through an outdoor craft market. 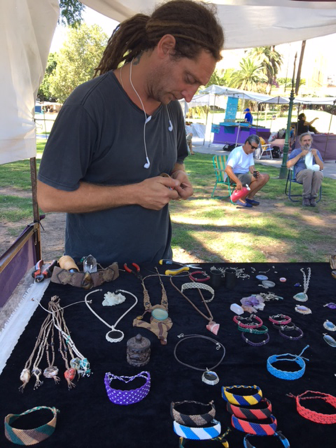 I bought a handwoven bracelet made by this fellow as a souvenir. 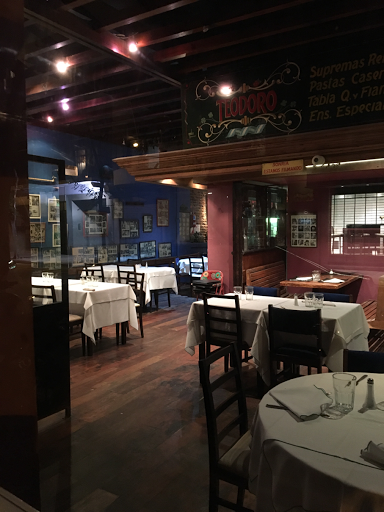 On our last night we dined at Teodoro, another of Alejandro's suggestions. I loved this restaurant, its bright blue walls lined with framed photos from the forties and fifties. Hubby had Argentinian beer and homemade ravioli. 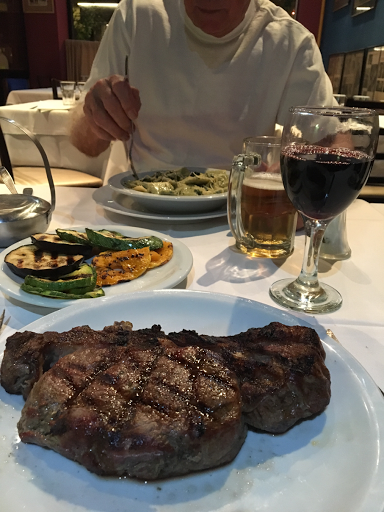 I had vino tinto and... a small steak. Ha. It was pretty big, for a small steak... just not quite as big as it looks in this shot. And man, oh man, was it delicious. That teeny plate of grilled vegetables you see on the table is the most vegetables I'd had in days. It's very hard to eat healthy in a town that seems to dine exclusively on meat, more meat, pasta, and cheese. As we toddled back to our hotel after dinner... maybe that should be "waddled" not toddled... we reflected on our experience thus far. 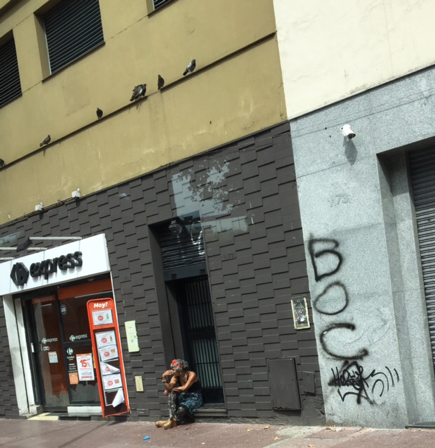 Buenos Aires is historic, sophisticated, and beautiful, which we expected. I know according to Hubby this post has not done justice to its magnificent boulevards and grand buildings. Sigh. Everyone's a critic, eh? So, the beauty and grandeur of the city we expected. 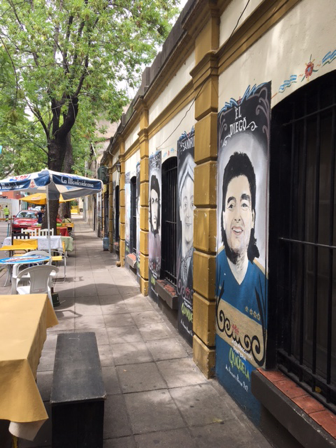 What we didn't expect was that the people of Buenos Aires would be quite so friendly. Virtually everyone we met was unfailingly polite, helpful, and gracious. From hotel staff, to waiters, to the lady selling programs at the Ricoleta Cemetery, who when she found out we were Canadians wanted to talk politics, and regaled us with stories about their former government run by "the lady" as she called their ex-president, saying how relieved she was at the regime change. And we were surprised too at how very patient everyone was as we struggled to use our few words of Spanish, and in my case tried to remember to say "si" and not "oui." As I said to Hubby, I never knew how much French I had salted away in my brain until I tried to speak Spanish. A rueful smile and lots of hand gestures also helped to bridge the language barrier. And funnily enough our love of cooking Italian food came in handy when deciphering menus. Except when I pronounced the double "l"s in pollo when trying to order chicken, everyone laughed. I guess the word "pollo" here is used only to refer to that sport with horses. They pronounce it "po sha" when they mean chicken. Travel is so educational, isn't it? We bid adios to Buenos Aires the next morning and made tracks for the airport. Patagonia bound. Hiking boots all polished up and ready to roll. We were excited. For, as much as we loved Buenos Aires, we're not really city people. And the mountains and open spaces of Patagonia would be much more our style. 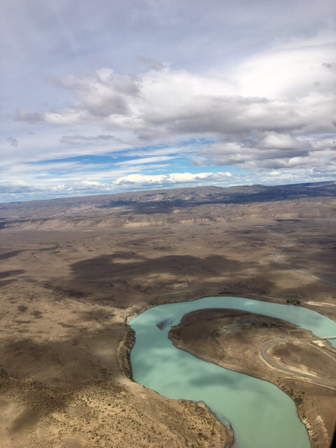 I snapped the two shots, below, from the plane as we flew into El Calafate. Looks like lots and lots of open space down there, folks. Parte Uno of our South America adventure was history. We were about to find out what Parte Dos would have in store for us. Lots of sunshine, fabulous views, and some strenuous exercise we hoped. And maybe, just maybe, some vegetables? What a pleasant surprise! 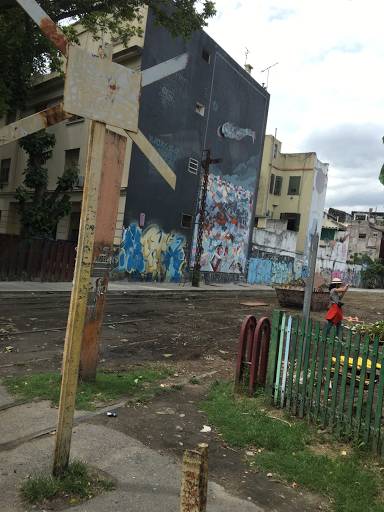 It was real pleasure reading your story about urban South-American experiences ! Yea! that you're blogging at all. Loved your post above. This trip is a big damn deal. And it deserves your attention. I'll keep checking in every few days to see how Parte Dos went. Continuing good times to you both. How wonderful for us that you still managed to create a post! I love being an armchair traveller along with in your journey. I've wanted to visit Argentina for a while after having taken tango lessons but now after seeing those vast mountains I feel like the hiking would be even more to my liking. I might lose quite a bit of weight though as I'm a pretty strict vegetarian with no dairy. Thank you for this post. Almost everything you describe dovetails with my memories of the Buenos Aires I visited in December of 1970. But I'm with you: Patagonia is going to suit both of us even more! Well, what a surprise, I was expecting WiFi silence from you. Did you tango?!! I find myself mixing French and Spanish these days too, must be an age thing as I didn't mix before; mine's SA not Castillano, I say that "zhj" for "'ll" too. Crossing my fingers you have time for another post and thank you for using up precious holiday time to write and faff around with WiFi and apps. 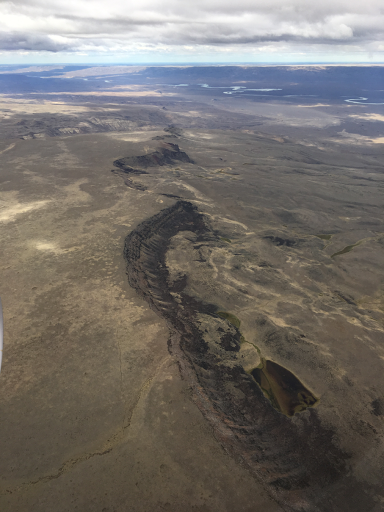 Loving your Patagonia pics. 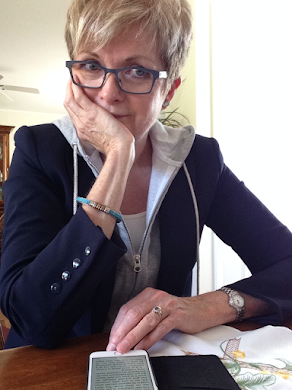 Hi Sue, thanks for taking the time to write and persevere with publishing this. It's been a joy to read, as are your Instagram photos and comments. It's certainly seems to be "a dream come true" journey so far. I've loved every minute,!!! Great to be able to travel there vicariously. We've just arrived home from Switzerland which was also a joy for me! Literally I was almost jumping up and down with excitement when we arrived!! :) I'll never tire of it. Thinking of you .... Safe travels and may the fun continue! Delightful post! Thank you for taking the time to update us. I know nothing about this area personally, and your experience is not only broadening my knowledge but encouraging me to consider visiting. Bon voyage for Parte Duo! 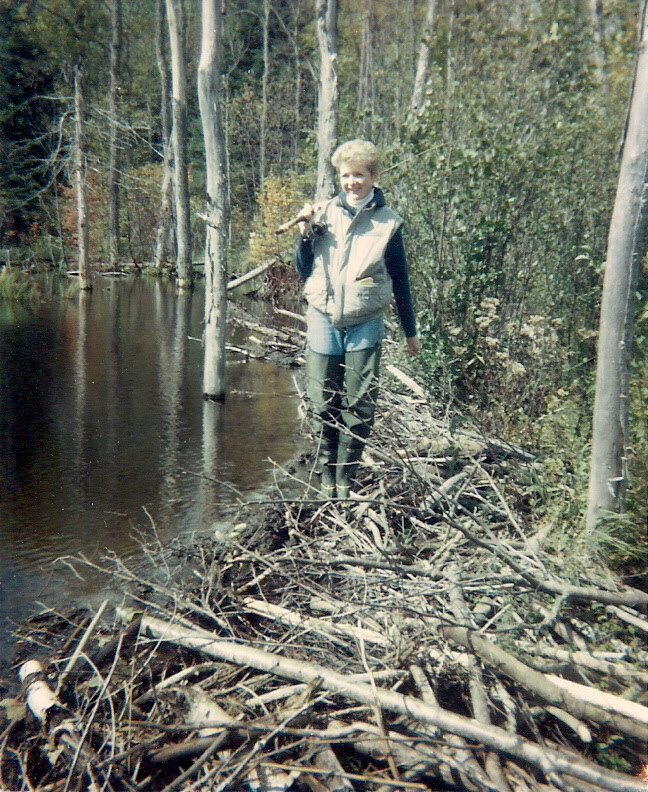 Thank you for taking the time to share - it's a virtual adventure for those of us reading. Have a great time in the wilds of Patagonia. Thanks for keeping us updated! Virtual travel is the next best thing to being there. So interesting to hear of places I've never been. The contrast of city and wild is so interesting. Thanks again for your updates. Anxiously awaiting the next installment! I was so happy to see you in my inbox this morning. So while, I sipped my coffee I chair travelled far, far away. Safe travels, Sue! Love this post and your pictures! Traveling vicariously is the best. Thanks! Thanks for taking some precious vacation time to update us on your travels. I have been following along with your IG pics and it all looks amazing. You will have incredible memories to reflect upon when you are home on those cold winter nights. Take care and enjoy the rest of your journey. So interesting! Thanks for taking the time to share. We're just back from Mexico. Not a resort holiday this time, but a visit with friends who live there. I can definitely identify with your struggles with Spanish. I, too, have more French hidden away in the deep recesses of my brain than I realized. I actually found it helpful in deciphering some of the Spanish, though, as there seem to be a lot of similarities between the two languages. Apparently Spanish pronunciation isn't universal, however. In Mexico, or at least the part we were in, they pronounce "pollo" poy oh. Living vicariously through you two. Enjoy! wow, it looks amazing! Can't wait to read about your Patagonia adventures. Thank you for updating us...difficult as it has been. Yes, I remember Blogsy and how awful it was. Not to worry, as they say. We will all be glad for any news at all in the next few weeks! Thank you very much for taking time to post. Your efforts are much appreciated. What a wonderful post, despite the difficulties you had with Blogsy -- I've ended up deleting that app -- it worked fairly well at one time, as did another BlogGo, but lately they just incite swearing. . . .So thanks so much for persevering with so much generosity. Your trip looks just magnificent so far. Love what you say about travel and education and embarrassment. Too bad they seem so often to be linked! Thanks! We're headed there next week and it's great to read what you thought of it. We'll be there for a month, so I hope you blog about more places - since you're just ahead of us.